Navy Yard shooting: Reports of shooting at Washington D.C.’s Navy Yard, near the site of 2013 massacre. 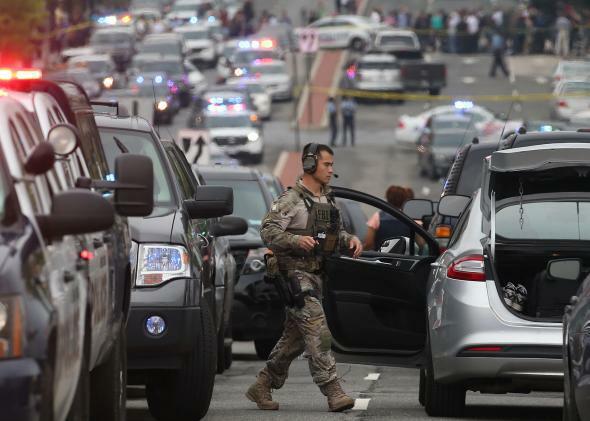 Law enforcement officials respond to the Navy Yard facility July 2, 2015 in Washington, DC. Update, 10:05 a.m.: The FBI has given the all clear at Navy Yard. Update, 9:35 a.m.: Multiple local news outlets reported that the reported shooting at Navy Yard was a false alarm and there were no victims or shooters. The lockdown was still in effect as of these latest reports. Original Post: Police responded to reports of a shooting at Washington D.C.’s Navy Yard on Thursday morning, as the area was placed on lockdown and residents there were told to shelter in place. #BREAKING: @CNICHQ @NavalDistWash #NavyYard lockdown/shelter in place. Investigation continues. No further info at this time. Navy Yard was the site of a 2013 mass shooting at the Navy Yard’s the Naval Sea Systems Command that left 13 people dead, including the shooter. Washington Mayor Muriel Bowser said the city was monitoring the incident. This post will be updated as news develops.